SPY fell by 0.5% this week, while my account rose 0.5%. Both of these figures have returned to within 0.1% of their values as of May 11th, eight weeks ago. My loss-floor has risen to -7.7%. Euro economy: Greece has reported to the Troika that its citizens have stopped paying bills in Euros. The people have lost faith in their currency, so re-drachma-tization *should* occur soon, but it seems the Hellenic Government still isn’t ready to face that music. US economy: Friday’s Nonfarm Payroll report was bad, so the market fell (and will probably continue falling for Monday and Tuesday). There have been a slew of negative warnings for the Q2 earnings reports. US markets: Closed on Wednesday for Independence Day. Tuesday was a half-day. TNA: Max-loss above zero! That hasn’t happened since last November. The stock got sold later that same day, but still — I made it to the “guaranteed” profit level. The big problem this week was Opera’s NO_MODIFICATION_ALLOWED_ERR, which I got during Tuesday’s stop-adjust (worked correctly on manual retry). Same problem occurred during Friday’s stop-adjust (but the adjustment went through anyway?) Same problem a third time prevented the SRTY purchase from going through (I used a limit order). Clearly, Schwab has screwed around with their order-entry process YET AGAIN. I shall have to look into that this weekend. Another problem: Schwab failed to reset their ”volume so far today” value to zero for July 4th, so the robot did a spurious stop-update on Wednesday. TNA: Robot failed to detect the “sell” signal at 11am. The 10am IWM quote from Schwab was $80.60 (stockcharts.com said $80.54), then the 11am quote from Schwab was $80.54 (stockcharts said $80.44). So the price of IWM “really” fell 10¢ during that hour but the robot saw a 6¢ drop. My previous change to the TNA/TZA models was supposed to allow a “slop” of 0.1% price rise while still matching the sell-rule ”price must have fallen during last hour” — but I had coded it wrong so it actually required that the price had to drop by at least 0.1% (= 8¢ for IWM). The robot tried to sell at noon, but I had already sold manually. 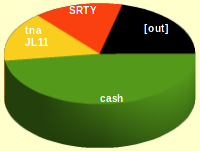 Bug has been fixed, but this reduces 2008..2011 TNA profits by 2.7 %-points (no effect on TZA profits). Just dropping the “price must fall” rule would cost an additional 7.7 %-points, so I guess I’ll keep putting that off. SRTY: Robot tried to buy at the proper time, but got the dreaded NO_MODIFICATION_ALLOWED_ERR. I successfully used a limit-order to obtain the model’s expected price several hours later. Refinement: Add a 3% hard stop in addition to the 10% trailing. This reduces 5½ year profit from 15.4% to 15.2%, but reduces the maximum loss from 1.5% to only 0.5%. Using weekly indicators for IAU. Time = Friday at 4pm (after-hours trade). MACD(14,25,9) is greater than 0. MACD(14,25,9) has been less than 0 since last sale. Time = whenever US markets are open. Current price < 90% of highest price seen since purchase or 97% of purchase price. On Friday, gold jumped sharply after the NFP report, but then settled back down. Weekly MACD is still rather negative. A “buy” signal for this model does not seem imminent.